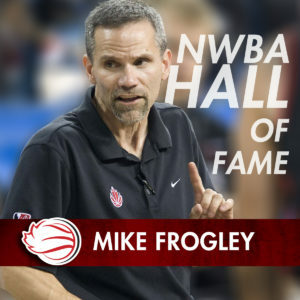 Last Saturday, the National Wheelchair Basketball Association (NWBA) held its Hall of Fame induction banquet to welcome Mike “Frog” Frogley and three other individuals into their Hall of Fame. Frogley was recognized for his impact made in wheelchair basketball in the Intercollegiate Division. Frogley, originally from Ontario, Canada, returned to his alma mater to coach the University of Wisconsin-Whitewater wheelchair basketball program in 1999. He went on to foster a legacy of excellence in men’s and women’s collegiate wheelchair basketball, both at UW-Whitewater and the University of Illinois. Frogley led his teams to a combined 12 national championship titles in the Intercollegiate Division. In 2009 Frogley received the Bob Szyman Leadership Award of the Junior Division for his long-term leadership and development of academic recognition program for athletes of the Junior Division. Frogley currently serves as National Academy Director and Head Coach for Wheelchair Basketball Canada.